When you became a believer in Jesus, you also became a “fellow.” That sounds kind of weird, doesn’t it? But understanding your relationship with Jesus in this context, reveals the depth and closeness God longs to have with you. So let’s follow this through for a while! A fellow, is generally defined as a member of a group having common characteristics, like-mindedness, and a common mission or purpose. While God wants you to fully lean on Jesus’ superiority for leadership and wisdom, He also has called you into partnership with Him as He goes about bringing His Kingdom’s presence into the world. That makes you one called into fellowship with Him. An earthly superior, let’s take a king for example, may exert his authority over his subjects from the distant confines of an unapproachable castle, demanding obedience with impunity. But Jesus is a King of a completely different order. Jesus is a faithful King that calls you into a deep, personal fellowship with Him! And His demands are intended to bless you richly, draw you ever closer to Him, and to give you amazing Kingdom work to do! So enter today knowing that you are not a mere subject. You are a blessed fellow, in a blessed fellowship with God’s one and only Son, with a blessed common purpose. Carry it out today! Are you looking forward to just another mundane day at the office. Well God has an antidote for that. You inject it directly into your heart and it not only cures workday “blahs,” but returns a huge reward too. There is a great difference between work done for the Lord and work done for others. Here’s the typical workplace chain of command: you work for your boss, who works for upline managers, who work for executives and shareholders, all working ultimately for your company’s customers. You get paid for the work you do, your boss gets paid, the executives get paid (much more! ), and so on. God has a different authority structure and payout plan. God’s idea is to replace the word “work” with the word “serve,” and the word “boss” with the name of Jesus. When you adopt an attitude of service to the Lord in your work, two incredible things happen. First, your work becomes a “heart thing” instead of just an obligation and a paycheck. Second, because your heart is behind it, you become more effective at the work you do. Jesus gets right in the middle of work that is done whole-heartedly for Him. 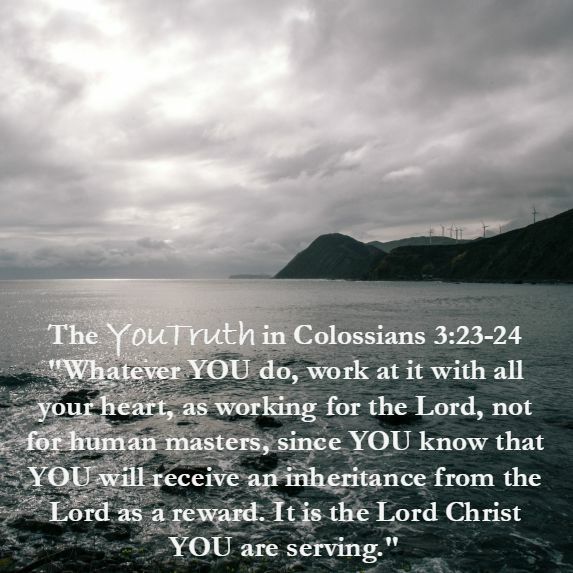 The work becomes less about what your company pays you to do, which can be very limiting, and becomes more about the eternal reward the Lord promises you and the glorious purpose for which He has you in your workplace. Work today, as working for the Lord, with the assurances of compensation far beyond a paycheck and effectiveness supplied by Jesus Himself. See what a difference it makes! The image of the cornerstone of the Temple in Jerusalem had been used for hundreds of years to describe the coming Messiah. When a builder in antiquity began a building project, the first task was to select the very best stone to be laid down first, around which, the rest of the building would rest. The quality of this first stone determined the quality of the rest of the building. If the building in question was to be the Temple, the house of God, particular care would be taken in the cornerstone’s selection. This was a very important building! When God decided to build His true spiritual house, the family of believers saved by grace, He chose Jesus as His cornerstone. In order for God’s house to be eternally perfect, He had to start with a perfect first stone. Jesus is it. God could now add the other stones that would make up the walls, floors, and the roof. That’s where you come in! God invites you to be built into His eternal home. It is not an inanimate structure built of rock and mortar. God’s Home is built of living stones, eternally resting on the Living Stone that is Jesus. Once a part of such a living structure, what you can offer is pure, pleasing, and acceptable to God. Be a living stone today, for you rest on the perfect foundation of Jesus!